Power Output: 5W Height: 9.5in. The Pignose Legendary 7-100 portable amp can be perfect for musicians at any level. Perhaps you're an aspiring street performer who loves playing your music for different audiences. Or maybe you’re a beginner musician who just needs something simple to practice to become like legendary musicians. 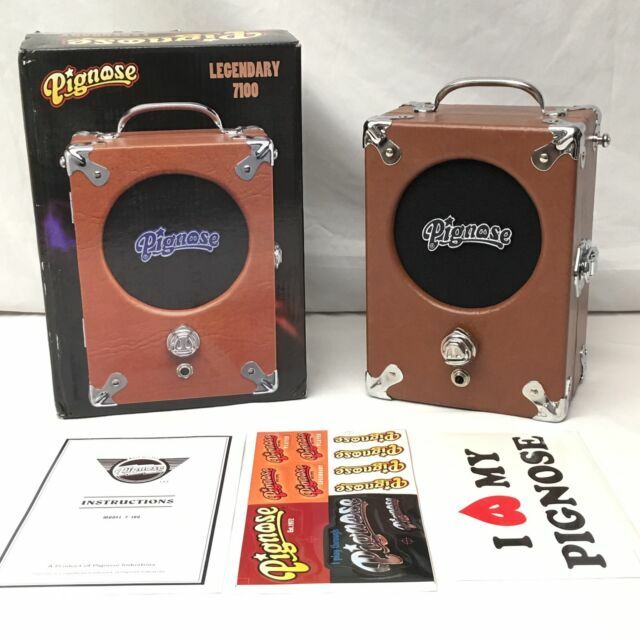 The Pignose Legendary 7-100 portable amp is an icon in the realm of portable guitar amps. It can allow you to rock out with your electric guitar anywhere that you want. This amp features five watts of power and a five inch speaker that can work with any guitar. The Legendary 7-100 sports a very simple console with the “Pig Snout” on/off switch that doubles as volume control.The enclosure itself also affects the overall tone and sound output. You can achieve a bass driven and bluesy style of tone by simply leaving the enclosure closed. By leaving the case open, you can experience a more full range rock and roll sound. Accordingly, you can have one of your friends open and close the case itself. This can create a unique wah effect right when you want it. This feature can spice up your riffs while you are playing your songs live. The Pignose amplifier can be an efficient preamp that can work with any of your chosen guitars. It can offer a preamp jack outlet for plugging guitar pedals in for that great distortion and reverb music that everyone can love. This mini Pignose amplifier can be used with accessories to really enhance your songs.This Pignose combo amp is an exclusive tweed collector’s edition. This combo can be powered by a battery or an external power supply. It can also be plugged into a larger PA. This convenient little amp can work with or without an adapter and specialized gear. The product can be perfect audio that you will want to record. With this guitar amplifier, you can meet all of your recording needs. This amp can be perfect for both acoustic and electric guitars. One of the more significant features of the Pig nose guitar amplifier is its size. It is compact enough to fit into a backpack, a locker, or other small space. Its small size can make it ideal for travel and can beat many of the other amps that are on the market because of all of this benefit. 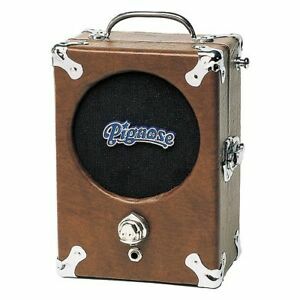 The Pignose guitar amp can not only an affordable option but can also be durable and reliable. You do not have to worry about anything as you travel. What can blow you away is that this simple Pignose amp has good sound and really accentuates your playing. You can sound great no matter what type of music you play. You can take your performance to the next level. With this amp, you have the potential to earn money and make a living by playing music. This is an amp that you can rely on for years to come. You can enjoy playing well known rock, blues, or classic rock songs. You can turn heads wherever you go. You can complement your playing with this Pig nose amplifier that can be ideal for home studios and professionals that play on the go. Awesome!-Can't be beaten for bedroom level tweed tones. I have the tweed covered version of the legendary 7-100, so it sounds the same as the leatherette covered version. I was very surprised at the rich tone of this amp. I am using it with 6 AA's not the power supply (dont know what difference that makes tonally) and it sounds like a tweed champ. You can get clean tones that have just a touch of twang with single coils or weaker humbuckers (gretsch) at a lower volume and form 1/4 of the way up you get progressively more and more tweedish ( let's face it-tweed breakup is basically distortion that fuzzes up as the gain increases) type distortion. With a tele you are in rolling stones territory, and with a humbucker equipped guitar you are in Neil Young land. It is awesome for recording, just stick your mic in front and go! It takes pedals well also. I love the simplicity-no time spent tweaking controls, plug in and rock. That said; this is not an ideal amp for a young beginner guitar player. A young kid will not appreciate what this amp gives. But for experienced players who like a "tweed' tone at a dirt cheap price this cannot be beat. Also, dont listen to the nonsense from guys who own one of the "original" ones that these new ones are no good-that's crap. The circuit has not changed regardless of who constructs it. A WONDERFUL STRAIGHT FORWARD NO FRILLS GUITAR AMP! This amp is surprisingly loud enough to hear properly, has a fuzztone and also sounds great clean. I used it full volume which makes full distortion but if you cut your volume knob on your guitar down it becomes crystal clean and sparkling highs. I play it with a Fender Stratocaster and it sounds great! Battery operated or with an adapter it works great. I also like the strap buttons on the amp that you hang the amp on your should with any guitar strap and walk around playing. OK, I'm a guitar player/builder/repair tech (for 46+ years now). I collect/repair/buy/sell these things and have owned dozens of em in varying years and all of the limited editions, these are great little amps, the older ones do sound a little better than the newer ones, regardless, they all sound great. The portability/battery power makes em great for travel, camping , street performance. Also the line out makes em great for recording, use as an overdrive, or going direct into the PA. They are tough as nails, I've taken and used em everwhere you can imagine, even had one fall down a flight of stairs once, still worked fine. I even took one across Lake Ontario on a small boat. They are also a great harmonica amp. The available AC adapters are handy but I usually just carry spare batteries. One final "note" (pun intended)if you opt for the AC adapter, I reccomend spending the few extra bucks for the regulated version (the non regulated ones produce some hum) again, I just carry extra batteries !! This is Awesome for it's size & Sound! This is Awesome for it's size & Sound! My friend had one of the 1st one's that came out! I made a small portable amp w/ a 10" speaker; but his would sound so much better! I had to have this NEW Tweed Model! To go with my Tweed Fender case & vintage Fender guitars! I love that it has the preamp out feature, I plug it into my Tweed Blues Deluxe 'amp in' feature & it sounds so perfect 'bluesy' too! It's definetly worth getting!